The Chantilly Stax Crystallized Glass Mesh-Mounted Mosaic Tile is frost resistant with water absorption of less than 0.5% to satisfy most surfacing demands. 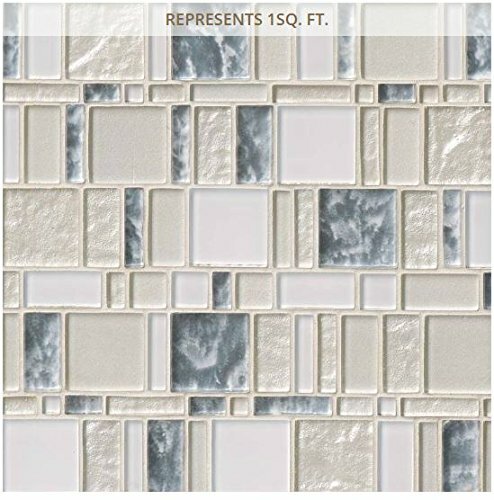 This beautiful tile features a crystallized glass with seemingly random arrangement of tile strips on 11.85 in. x 11.97 in. mesh sheet that makes installation a much easier process. This tile has a unique mosaic design with an attractive combination of handsome gray, warm beige shades and slight variation in tone to coordinate with a variety of design schemes. Designed for wall use, this impervious glass tile features an unglazed, high-sheen finish to help enhance your decor.